Arab resident of Samarian village of Hawara arrested after stolen coins, jewelry, figurines and other ancient artifacts found in his home. Israeli police and members of the archaeological department of the Civil Administration raided the village of Hawara in Samaria and confiscated hundreds of highly valuable old coins from various periods, as well as pitchers, earthenware items and jewelry. 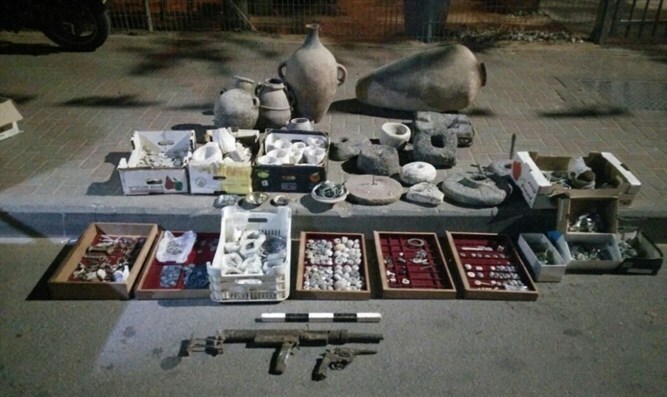 The forces arrested an Arab resident of the village in his fifties who is suspected of purveying ancient artifacts, not announcing their discovery as required by law and illegal possession of weapons. The search in the suspects house and store revealed hundreds of coins, pitchers, figurines, earthenware scales, jewels, basalt stones used to grind wheat, copper utensils, water and oil jars as well as a Sten gun and a rifle. Members of the archaeology department estimated that the artifacts were from the Hasmonean, Bar Kochba, Second Temple, Assyrian and Roman periods, which would make them range from 2nd century B.C.E.to 2st century C.E. and are worth tens of thousands of dollars. The Arab claimed on investigation that he had bought the artifacts for his own private collection. The investigation is continuing.